There's not too many international productions currently running of Phantom, alas... But there's been in the past, and there'll be in the future. I thought we could discuss them all here (except, of course, those with an own topic). First, the Argentine production is closing on November 29th. Alas! I hoped it would run for a long time, but it seems the timing was kinda bad... Don't know if it was scheduled for such a short run to begin with, though - might be. I wish we got to hear a lot more from it, but little has surfaced on the internet. Of course, I haven't sought out Spanish forums etc... Probably much more activity there. So Phantom could be the one. But "Spamalot" is also an option. I thought about "Kristina från Duvemåla", but I don't think it's mainstream enough, and I also think there'll be no production before the eventual Broadway premiere. "The Producers"? "Beauty and the Beast"? "The Little Mermaid"? Other ideas? Must be a fairly new musical, as all the old classics has been produced already. And a big and glossy one, for the whole family. I hope it isn't Phantom. I won't be able to see it in the autumn 2010 I think. I want them to play Phantom of course but preferably a year later . Phantomlove wrote: I hope it isn't Phantom. I won't be able to see it in the autumn 2010 I think. I want them to play Phantom of course but preferably a year later . I tried to email the producer, but she hasn't replied... So I guess we'll have to live with the uncertainty for some while still. But I agree - I want to see Phantom with you there, and since autumn 2010 is a bad timing I want them to do it later on. That also means I would have time to write something snazzy about Bjørnson and other elements of Phantom and Scandinavia. Eeeeeeek!!! What is that terrible pop-synth-Overture thing from the official Hungarian site??? operafantomet wrote: Eeeeeeek!!! What is that terrible pop-synth-Overture thing from the official Hungarian site??? 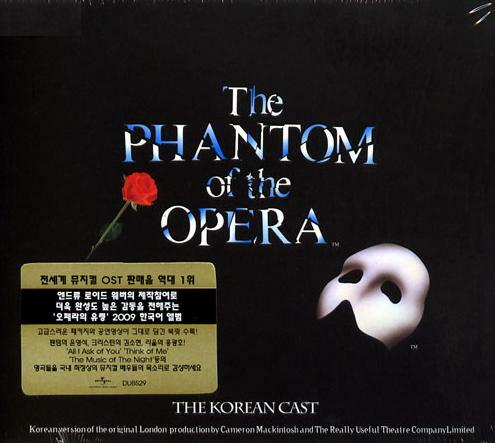 OK a question OF GLOBAL IMPORTANCE now: is it true that the current Korean revival has made ANOTHER Korean cast recording with a different cast (though the same Phantom, I gather)?! If this is real, I WANT I WANT I WANT! The last time a cast recording came out was 6 years ago...way too long! (No, the Polish one doesn't count, I'm pretending it doesn't exist...that's the only cast recording I've ever refused to buy ). Where on earth can we buy this from?! EDIT: It IS real! See the cast recordings thread I've created. Scorp wrote: If this is real, I WANT I WANT I WANT! The last time a cast recording came out was 6 years ago...way too long! (No, the Polish one doesn't count, I'm pretending it doesn't exist...that's the only cast recording I've ever refused to buy ). A wise decision... I am the less-proud owner of the Polish cast album, and I could barely listen through it once. The lead roles are so weak it's embarrassing. But it was a birthday present from a friend who had just been to Poland, and I'm glad she thought of me and bought it (so I didn't have to use time and money to seek it out... ). Ok, this seems like as good a place as any to verify these facts. I'm working on updating my Meg site and since I'm rather behind-the-times where international productions are concerned, can anybody help me out here? I know things are wrong and missing since I'm so out of the loop lately, so can anybody here fill in the blanks or make corrections? Thanks in advance. "Seol said that one of the biggest changes from the 2001 version is its translation. Over the last six months, the Korean creative team staff has strived to readjust some of the flawed lyrics of the past. For the new version, the Korean creative team has a stronger voice in the production. The RUG Company of London has trust in us because of the success of the 2001 production,'' said Seol." However, the company will not release the cast list before each show to prevent an unbalanced preference for certain actors. HUH??? Are they trying to beat HMT in lousiest cast info procedure? "The Phantom of the Opera": The Korean production of the mega-hit West-end musical, "The Phantom of the Opera," returns from Sept. 23-Aug. 8, 2010 at Charlotte Theater in Jamsil-dong, Seoul. A British team performed here in 2005 featuring popular musical actor Brad Little as the phantom. This year's show will be more spectacular than previous years, with a reinforced set and stage settings. A little bird told me that Berlin is now out of the list of next German stop of Phantom, and that they're heading for Kiel instead, apparently in the to-be refurbished Kiel Opera House. I don't know how solid this rumour is, but if this is indeed the case, I'm not opposing it. operafantomet wrote: A little bird told me that Berlin is now out of the list of next German stop of Phantom, and that they're heading for Kiel instead, apparently in the to-be refurbished Kiel Opera House. There's rumours about Phantom being played again in Germany? Produced by Stage Entertainment? Because if so... I'd be a very happy bunny! However, I doubt they'd take the show to Kiel. It's a relatively small town, too far away from everything (obviously closer to you though, hehe) and I'm not sure it would be profitable. Berlin still seems more plausible to me - it's the only "corner" of Germany Phantom hasn't played in yet. Ooh, a new German production could be interesting! Wonder who would be in the cast this time? Hopefully we'll find out more (including exactly where it'll play) soon! They are re-opening, gutting remodeling the whole shebang, an historic opera house near where I live. (...) Anyway the doors are set to re-open in a big ceremony in Dec 10 as of the schedule as it stands right now. I already bought a ticket package (...) that includes the opening gala and party and a short exhibition show, a show the day after they open, and a pair of open date tickets to six shows that have to be used within a year of the open date, and Phantom is scheduled to be their second show after opening. I may burn all my tickets seeing it repeatedly or I may not but by this time next year I will have seen it live at least once. I have a quick question for anyone around back when Phantom was in the Netherlands. Did it ever play at another theatre besides the Circustheatre in Sveghjhkasjhkdj I cant remember the name of the town? I;ve seen references in the past to Phantom at Theatre Carrie (or something like that) and thats a different theatre all together. justin-from-barbados wrote: I have a quick question for anyone around back when Phantom was in the Netherlands. No, as far as I know they solely played in Theatre Circus in Scheveningen, from 1993-1996. They did more that 1000 performances there, which is quite impressive. Haha, brilliant. I would totally do that! "Wie tief sich dein ****** ******"
But what are the missing words? When I search the internet, all I get is the German libretto, which I already know. There's also one person's attempt at transcribing the Austrian libretto, but it's also missing that exact line. I understand the meaning of it, but it bugs me to be missing that. Anyone know it? EDIT: I don't think I'm right about the verb anymore, so that makes two mysteries. Its funny because when i checked the Austrian libretto I have, that gave that line in English. I guess you're not the only one that cant understand the word. gib ihr die Freiheit, nun lass sie! PHANTOM Wie tief ist dein Your lover makes a passionate plea! Sag dir das gar nichts? Ich lieb sie! PHANTOM Auf mir hat niemand Mitleid gezeigt! "Wozu sich dein Geliebter versteigt!" Huh, that's weird. Because he's not saying "Wozu" in the recording. However, I suppose he could be saying "Geliebter," slurred to fit into two syllables? EDIT: I looked it up. "Wozu sich dein Geliebter versteigt" are the lyrics in the German-language version of the film. Perhaps that's the libretto you have? No, the libretto I have is from the Austrian version of George Perry's book. It's basically the George Perry book in German but the ALW part is changed from the original London production to the Vienna production. It's a quite cool book, very rare I think, and not even mine. It's my friend who owns it but I have photocopies of it. At the end of the book is the Austrian libretto. It's probably printed sometime at the end of the 80s or beginning of the 90s. I guess it's an original lyric that wasn't used in the end. And then they used it in the film for some reason. I have an old version of the Swedish libretto too, that the translator emailed me several years ago. There are quite a lot of different lyrics in that one too, compared to what was used on stage. I know the German dub went back to parts of the Vienna libretto and partly re-translated some lines, to make it a better match with the lip movements. Would be little point in using the general German libretto if it would screw up the lip sync. Ah, I see! Boy does that book sound cool. How lucky to be able to get those photocopies of it. Makes sense with the changing lyrics. I am starting to believe that the word really is Geliebter, though (at least, that's by far the best solution I've found so far), so it was totally helpful despite the change. Thanks! That really makes my day! You have no idea. Yeah, I'm noticing the German dub is an interesting mix of Austrian, German, and new stuff, although I find I'm not a fan of a few of the new translations, even if they do match the mouths. Oooh, this is interesting! Just gave it a listen and it definitely sounds like 'Wie tief sich dein Geliebter ????'. It's the final two syllables that I can't get. It almost sounds like 'vielleicht' but that wouldn't really make any sense. There's definitely an L sound in that final word though. I actually prefer Kunze's translation that was used in Vienna more than what is used nowadays in German-language productions. 'Der letzte Schritt' is much more imaginative and fits more with the song than the clumsily titled 'Von nun an gibt es kein Zurück'. 'Engel der Muse' makes no sense to me, I prefer 'Engel der Lieder'. And don't ask me why but I like 'Die Musik der Dunkelheit' as a lyric more than the more faithful 'Musik der Nacht'... The film dub seems to be a weird mish-mash of both plus some extra stuff thrown in to match the vowels that are coming out of the actors' mouths. I hate the German film dub anyway; even if it does have the marvellous Jasna Ivir on it, she's too restricted in imitating Margaret Preece and Uwe is just baaaaad. Was there any reason they randomly translated 'Learn to be Lonely' for that dub?! I REALLY recommend getting the Vienna version of the Perry book if you can find it. I got mine on eBay and was very lucky to get it. Not only does it have the entire Vienna libretto at the back, but it has way more photos of the production that even the souvenir brochures have. There are some really cool rare ones too, including one of what the Theater an der Wien looked like when Phantom played there and some great ones of the props in the wings and the proscenium set-up. The title is Alles über das Phantom der Oper. Save it as an eBay search and it might turn up one day. That's what I did. As Josefine says, the entire chapter about the ALW version is modified so it talks about the Vienna production rather than the London one, so you get bits of interviews with Goebel and Nistler which is cool. The Vienna production has been a favourite of mine ever since I got the recording years ago (it was the first foreign one I bought), and yet I never saw it! If you're ever in Vienna, it's worth swinging by the Theater an der Wien because the shop there still sells Phantom postcards with production photos on them. Scorp wrote: I actually prefer Kunze's translation that was used in Vienna more than what is used nowadays in German-language productions. 'Der letzte Schritt' is much more imaginative and fits more with the song than the clumsily titled 'Von nun an gibt es kein Zurück'. Oh I SOOO agree about that title. "Der letzte Schritt" sounds a lot more powerful and imaginative. It's "Wie tief sich dein Geliebter verneigt" ! Ah, "verneigt" is what I originally came up with, and then I chickened out and took it back! It was the only thing that made sense. Thanks so much. I'm really, really happy to finally know what it is for sure. You guys are awesome. In general, I prefer the Austrian translation, although there are things I like about each. For all of its faithfulness to the original, the new German translation just sounds a little klunky and forced sometimes. I always felt like the Austrian lyrics had more style. But perhaps it's just my bias. The version of 'Von nun an gibt es kein Zurück' in the film is just terrible, in my opinion. Icebergs and Lava? I will definitely keep an eye out for that book. I wish I had known about it before. Thanks, Phantomlove and Scorp, for the info!